Sharrief Grice will kick off his sophomore season at Boston College this weekend and the 6-foot-1-inch, 224-pound linebacker from Naugatuck is looking to stake his claim on defense for the Eagles. Grice, a three-time New England Preparatory School Athletic Council defender, made the All-New England team at Kingswood Oxford while earning All-Fairchester Athletic Association first team twice. Grice helped lead the Wyvems to their first NEPSAC Bowl game and as a senior had 53 tackles, five sacks and two interceptions. 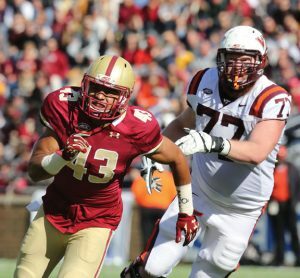 Last season, Grice played in all ten games on special teams as a freshman for Boston College, which finished the year 3-9. This season brings a host of new challenges and Grice — the recipient of the BC Linebacker Scholarship Fund — is looking for an expanded role on the defensive unit. The defense kept Boston College competitive last year, allowing 15.3 per game. It’s that defense that the Eagles are relying on to get them back to a bowl game. The Eagles will get the season under way on Saturday in Dublin, Ireland when they take on ACC rival Georgia Tech in a game that will be televised at 7:30 a.m. on ESPN2. One other date that has to be in the back of his mind is the Nov. 19 when the Eagles will host the University of Connecticut at Alumni Stadium in Chestnut Hill.